From time to time we get questions like "How do I know if my seat size fits me?" There's a lot of personal preference involved. Some people like a more snug fit while other want room in the saddle. It also depends a lot on the type of riding you're doing to do. As a general guideline, we've found that you can get an idea of fit if check how many finger widths you get between your leg and swell. 3 fingers is pretty typical. I like a snugger saddle. If there's too much room, I find myself slumping back and sticking my feet way forward. 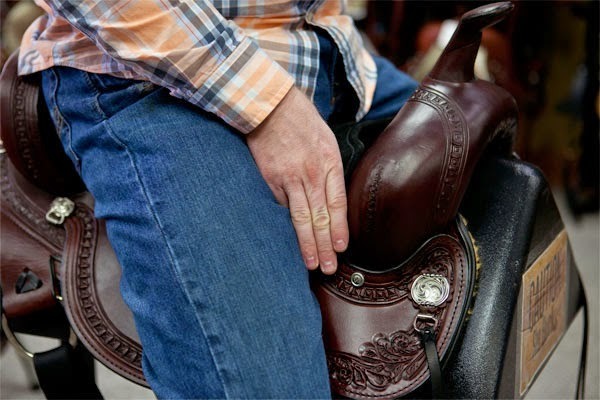 Do you like to ride with a higher cantle? Or a lower one? I think that can make a big difference too in the feel of the seat. I don't like extra room in the seat to the point that I can't keep my position secure. A lot depends on how the stirrups hangs too as to where a person's rear sits in the saddle due to where the rider's legs must be placed to reach the stirrups. It sure helps when the stirrups hang so my feet are directly below my seat. This keeps me centered and give me a more secure seat. I prefer a high cantle myself because almost all my riding is on trails. I want a very secure seat for going up and down hills and just in case my horse decides to hop over a creek or a fallen log. A good shaped horn helps in this respect too. One that I can easily fit my hand over in case I need to grab it to stay in the saddle if my horse moves unexpectedly... and if I have enough warning to grab the horn .